August is flying by and I’m savoring every minute of the warmth. It’s been ridiculously hot for late August, which has me crossing my fingers for an Indian Summer. By now, you all know that I am maxi obsessed and I’m so excited that this skirt is the perfect summer to fall transition piece. I will definitely be wearing this in the fall with boots and a chambray, but decided to pair it with a crisp, white crop top and native inspired jewelry for a sweltering August day. 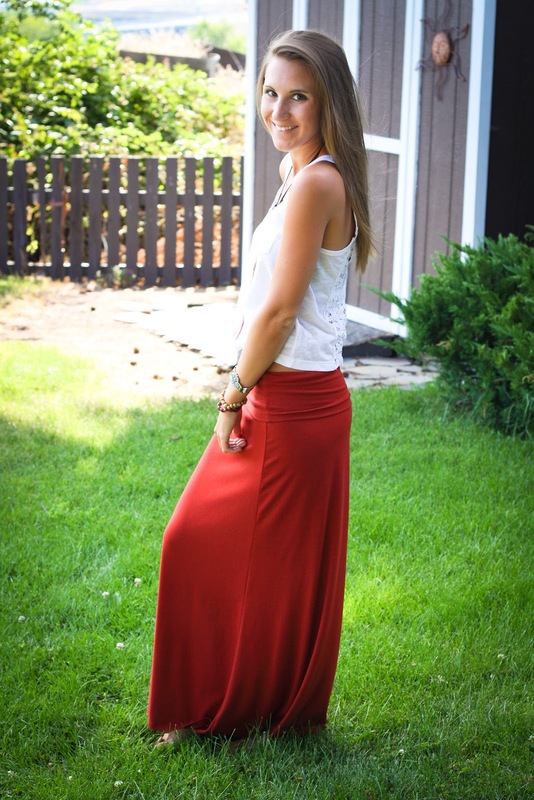 What a great outfit – LOVE he maxi skirt, and your jewelry is TDF! LOVE! This is such a stunning outfit, I was searching for a skirt like this today! I'm following you now, I really like your blog! wow, what a great outfit. you remind me a little bit of Pocahontas in these pictures, maybe because of your necklace haha you look really really great in this long skirt and i am totally in love with your shirt. you are sooo pretty, i love your photos. Thank you for the comment in my blog!!! Love your outfit, very Boho-Chic. I love this outfit! Perfect top to wear with this maxi 🙂 your jewelry is fabulous too! Thanks for your lovely comment ! Amazing blog, would you like to follow each other ? That's such a cute outfit and I love your necklace! I love all your accessories epescially the necklace! Oh! I really like the picture from the back and the face shots…but girl, your skirt looks pretty low there. Your hair looks so shiny! Feel free to check out my latest post too! awesome skirt. it's the perfect summer to fall color. I love this beautiful photos! such a nice blog, good job! LOVE the skirt, and your blog- you teeny thing! Wow! I'm jealous of your figure:) Great outfit post! I am maxi obsessed as well! haha I can't get enough of those long skirts and they go with EVERYTHING! I really like this post and you are so beautiful! Have a great rest of your night! Such a fun, relaxed look! That skirt is such a great piece! Love the bohemian vibe on your outfit. love your accessories. its great how they play with the red skirt. Love it. my goodness girl, you are gorgeous! i love this outfit and I'm soo jealous of your tan! awesome look, the first photo is amasing! Can u watch my makeup Tuto! It's for a contest and I need more views. Thanks for your lovely comment on my blog and for following me!! You're so nice! I loved your blog! You have a great style 🙂 I'm following you back! Oh man, your outfits just keep getting better and better! Loooove the maxi and your cool accessories you paired with it. So effortlessly cool! Oh girl, I wish I had the body (and tan) to pull off a look like that – love the necklace too! love this outfit! i really love your necklace! it add an instant wow factor to your outfit 🙂 loving the bohemian feel. hi dear, what an amazing blog! i liked ur skirt and its harmony with ur necklace. Awesome xoxo! you look so pretty and you shouldn't be jealous, because you have beautiful hair! ;)) btw great necklace! This is a great look for you! <3 Bohemian!